The Oly Mountain Boys | Pacific Northwest Bluegrass | Blog : Fall Grange shows, Polecat at Rhythm and Rye, White Horse anniversary! Fall Grange shows, Polecat at Rhythm and Rye, White Horse anniversary! After a great summer, settling in for October means grange halls, harvests, and hometown shows! We'll kick off the month as the featured band at the Adna Grange hall jam. Next weekend we're welcoming Bellingham's Polecat to Rhythm and Rye! And before the month is out we'll keep the Steamboat Stringband Jamboree spirit alive with a harvest party at the Prosperity Grange Hall! 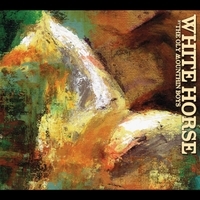 Meanwhile, we're celebrating one year since we released our Kickstarter-funded bluegrass concept album White Horse. Thanks to everyone who made it possible! To commemorate the anniversary and celebrate the artists and writers who contributed, we've made the ENTIRE 68 PAGE BOOKLET available for FREE download from our website!